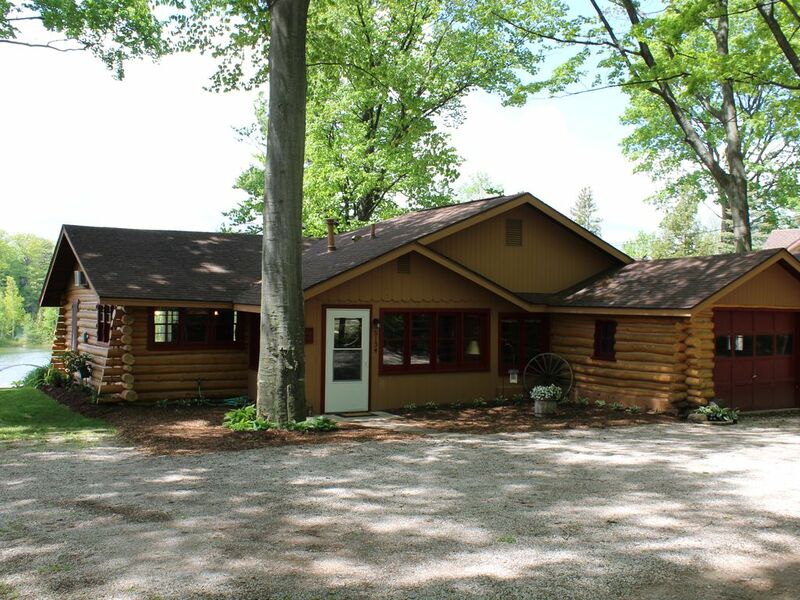 Enjoy our beautiful authentic 1950's log home on 65 feet of private lake frontage on the 'quiet side' of Silver Lake. Decorated with treasures from the family farm, the cabin is cozy and quaint with hardwood floors, handcrafted log, hickory and pine furnishings, leather sofa and love seat and maple cabinets. The kitchen is bright and cheery and is well stocked with all the pots and pans you will need, including a coffee pot. The dining area has a beautiful handmade hickory table. In the living room is a Vermont Castings gas stove with a glass front for those evenings when you want to sit by the fire. The cabin, with its original logs and chinking throughout, sleeps up to seven people. The sleeping arrangements are: two queen bedrooms, both beds are fitted with luxury mattress covers and bedding. The bunk room facing the lake features new adult size cedar log bunk beds (the bunk room is not air conditioned) and a twin roll away bed. All linens and towels are provided. We give you a starter paper supplies kit which includes a few paper towels and toilet paper rolls. For the angler, enjoy good fishing. Bass, bluegill, perch, pike, sunfish, and walleye. There is a lakeside deck with patio furniture and a gas grill for outdoor eating where you can enjoy the spectacular sunsets after dinner. There is a sandy beach and fire-pit. Firewood is available at several roadside stands or the nearby campground. We love to travel and have done so extensively with our two children. We have logged over 20,000 miles in our RV while taking our children to all fifty states. Traverse City is still considered one of the most beautiful places in the country in our book. We always look forward to spending time at the cabin because it is such a cozy and peaceful place. As a native of Traverse City, I grew up enjoying the lakes around the area. I was thrilled when Kurt and I had the chance to buy this log cabin. We worked hard to update it by adding modern amenities without losing the character and charm and that 'up-north' feel. It is just ten minutes to downtown Traverse City, yet you feel like you are away from it all. Traverse City offers such a great quality of life along with many wonderful local shops and restaurants to enjoy. A quiet and peaceful setting on the East side of Silver Lake. Our favorite thing to do during our stay at the cabin is pack up a picnic lunch and take a cruise around the lake on the pontoon boat. With the boat conveniently docked at the private sandy beach, there is little effort to enjoying the beauty of Silver Lake. This pristine, all sports lake, is the closest lake to Traverse City with easy access to everything. Our evenings usually consist of cooking delicious steaks from our family market, Burritt's Fresh Market while watching the fabulous sunsets. We always end the evening with a campfire next to the lake listening to the frogs and loons. Life doesn't get any better than that! Beautiful beach view from the deck. This has a nice sloping yard to the beautiful sandy beach. Cabin is direct Silver Lake Frontage only 50 feet from the back deck! There is a nice grassy backyard with campfire pit and clean sandy beach. The two queen bedrooms have window air units and the living room has a wall air conditioner. The bunk room does not have air conditioning. Fully equipped with dishes, cooking utencils, coffee pot, gas stove, refrigerator, microwave and dishwasher. The dining table seats six when you add the bench. There is also a table leaf in the bedroom closet to expand the table even larger. Internet, Direct TV, DVD, GasGrill, Portable Cooler for the boat. PETS CONSIDERED, NO SMOKING INDOORS- THANK-YOU! Interlochen Arts Academy (5 min), Grand Traverse Mall (5 min), Downtown Shopping (10 min), Choice of many restaurants (5min), Sleeping Bear Dunes (45 min),Beach Bums Baseball Stadium (2 min), There are also casino's and many wineries in the area.